Beautiful 2 door version of a 1930's Vintage Style Beauford wedding car. The Beauford is an extremely popular choice of wedding car and this Ivory coloured model fits in with the colour scheme of many weddings. 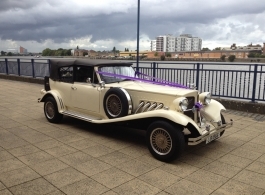 If you wish to have a vintage wedding car at a cost effective price then the Beauford is a great option for you. Please note: The front passenger seat of this car can be removed upon request to give easier access to the rear 2 seats.